Originally, Belinda's nature was far less integral to the plot. In fact she had come from a time school, abandoned by unknown parents. One version of the story would finish with the Doctor taking her to her birth place, only to find a number of vats, each containing a fully grown Belinda. A later version would have her father come to the school to find her and be revealed to be Thadius Torchwood. The story itself would show a spacebourne ship made of bone that comes into contact with the Doctor and then absorbs him in order to make use of his time travelling capabilities. 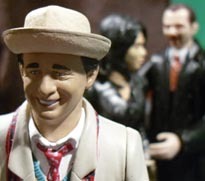 But the Doctor proves too overwhelming for the entity and it uses Belinda to try and kill him before he was absorbed. 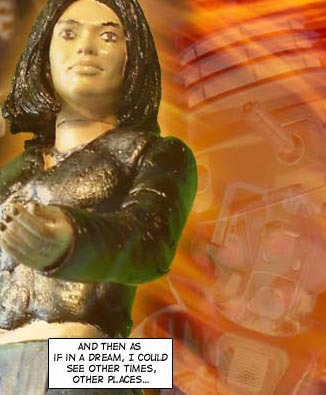 It even poses as the Doctor in order to get her to do it. 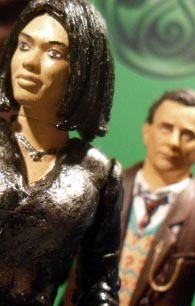 The idea that the Doctor hired Belinda was the only one to transfer into the final storyline. It took a lot of working out to make sure the story was precise enough to be understood. 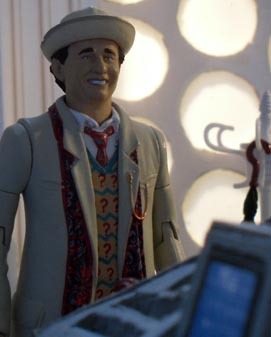 Filming for this story began on 22 Jan 2012 with the TARDIS interior scenes for the entire series. It continued on 28th January with the Gallifrey and Torchwood's ship scenes, also shot back to back with scenes for Paradox Lost that used the same locations. The next day, 29th Jan, the Gallifrey set was redressed to become the TARDIS cradle world. The final pick ups were the 'green screen' elements done on May 3rd. Editing began almost as soon as the story finished filming and was completed on 21 May 2012, about a month before it was needed online. 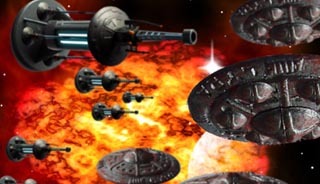 The Dalek ships seen at the end were first used in 2007's The Fate of the Obliviate. The Cybermen ships are new and based loosely on the design for The Invasion. So the Time Lords were hiding the war between the Daleks and the Cybermen. Did you guess? Have a look at some of the clues you might have missed along the way. EMPIRE OF THE TIME LORDS part one. The first mention of Vistan's special project. Hiding the war inside a 'human' TARDIS. Peri spots that there are gaps in the timeline. 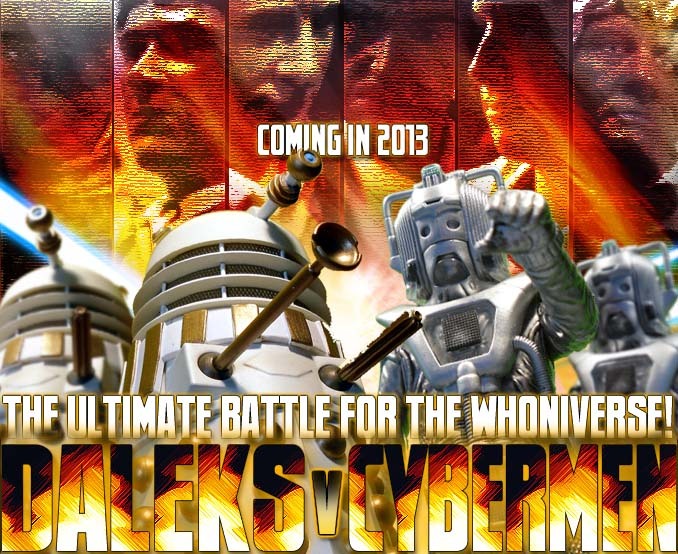 The missing elements of the Dalek/Cyber war. Sturg discovers the truth. 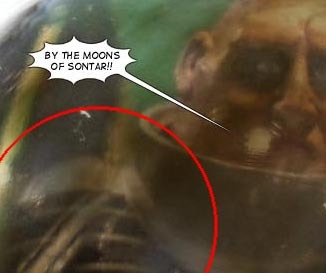 What's that reflected in the globe? Yep. It's a dalek. There was a cyberman on the other side but it didn't come out as obviously in the final image. 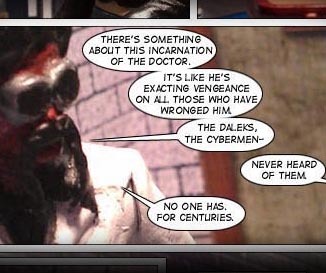 You'd be forgiven for thinking that Space Daddy's referencing Remembrance of the Daleks and Silver Nemesis here. 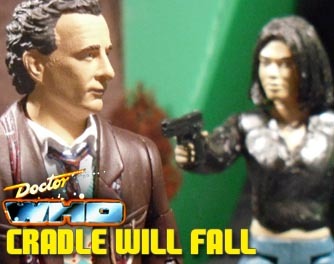 Season 25 stories where the 7th Doctor is taking care of unfinished business. But of course he's referring to the hidden war. The other massive clue. As the paradox hits, Belinda gets a glimpse of 'other times and places'. And so do we. Did you not spot the Dalek and Cyberman in the swirling vortex? The episode was posted on time on 23rd June 2012. For the 7th Doctor, this trilogy comes sometime after Survival. Ace has gone. Where and how? Well that's another story. This completes the first stage of the Time Lord arc began with Empire of the Time Lords, although traces of it can be felt as early as 2010's The Doctor's Dilemma and certainly in 2011's Timelocked.